SHERWOOD, Isaac R., a Representative from Ohio; born in Stanford, Dutchess County, N.Y., August 13, 1835; attended the common schools, the Hudson River Institute, Claverack, N.Y., Antioch College, Yellow Springs, Ohio, and the Ohio Law College, Poland, Ohio; editor of the Williams County Gazette, Bryan, Ohio, in 1857; elected probate judge of Williams County in October 1860; resigned at the beginning of the Civil War and enlisted April 22, 1861, as a private in the Fourteenth Regiment, Ohio Volunteer Infantry, and promoted through the ranks to lieutenant colonel; honorably mustered out June 27, 1865; settled in Toledo, Ohio, and was editor of the Toledo Daily Commercial; political editorial writer on the Cleveland Leader; secretary of state of Ohio in 1868 and 1870; organized and established the Bureau of Statistics of the State of Ohio in 1869; elected as a Republican to the Forty-third Congress (March 4, 1873-March 3, 1875); was not a candidate for renomination in 1874; proprietor and editor of the Toledo Journal 1875-1884; elected probate judge of Lucas County in 1878 and 1881; editor of the Canton News-Democrat 1885-1895; elected as a Democrat to the Sixtieth and to the six succeeding Congresses (March 4, 1907-March 3, 1921); chairman, Committee on Invalid Pensions (Sixty-second through Sixty-fifth Congresses); unsuccessful candidate for reelection in 1920 to the Sixty-seventh Congress; again elected to the Sixty-eighth Congress (March 4, 1923-March 3, 1925); unsuccessful candidate for reelection in 1924 to the Sixty-ninth Congress; retired from public life and returned to Toledo, Ohio, where he died October 15, 1925; interment in Woodlawn Cemetery. Sherwood, Isaac R. Congress Fifty Years Ago and Now: Speech of Isaac R. Sherwood in the House of Representatives February 7, 1925. [Washington: Government Printing Office, 1925]. ------. The Currency. [Toledo: N.p., 1873]. ------. The Heroic Literature of the War Period. [N.p. ], 1907. ------. Memories of the War. Toledo, Ohio: The H.J. Chittenden Co., 1923. United States. Congress. Senate. Committee on Pensions. Remarks of Hon. 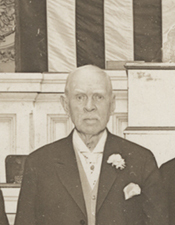 Isaac R. Sherwood, of Ohio, before the Pension Committee of the United States Senate, Monday, January 22, 1912. [Washington: Government Printing Office, 1912].